‏Daniel McCrohan is a prolific guidebook writer who has authored or co-authored more than 40 books for both Trailblazer and Lonely Planet. ‏He lived in China for more than a decade, and still specialises in travel in that region, but he is from the UK and relishes any opportunity he gets to explore his homeland, especially if it means another chance to go camping! 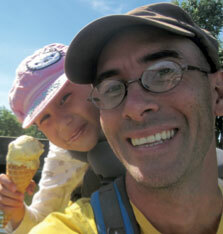 ‏Daniel has updated half a dozen Trailblazer guides (see the full list below), but rarely undertakes a hiking trip without his trusty sidekick, Yoyo, pictured here carrying out the crucial role of chief ice-cream tester for Cornwall Coast Path. For Daniel’s Hadrian’s Wall research trip, he brought along not just Yoyo, but his whole family from China; a once-in-a-lifetime experience that was documented on podcast by travel broadcaster Robert Kelly. ‏For Lonely Planet, Daniel has co-authored multiple editions of Lonely Planet China and Lonely Planet India, as well as working on numerous other Asia-based titles over the years. He has also written dozens of travel articles and online guides for various publishers, has created his own Beijing travel app, and has worked as a co-host on the television travel series Best in China. ‏Daniel’s next project is no lesser task than to update Trailblazer’s seminal guidebook, the Trans-Siberian Handbook. To keep up with his travels in China, Mongolia, Russia and beyond, track him down on Twitter or contact ‏him through danielmccrohan.com.